Unlike gentrified university students today, many students in the 1970s were very much concerned about socio-political issues. As the country was young, there were many opinions as to how to run it, what shape it should take, and what ideology it should adopt. Aspirations were plenty, and they clashed as they should, as enthusiasm was never lacking. Tan Wah Piow's (TWP) involvement in the industrial disputes as a student was just one of the examples. Unfortunately, that involvement turned violent. Juliet Chin, a 22 year old Malaysian architecture student, became the first woman to be elected as President of the University of Singapore Students' Union (USSU) in early 1974. 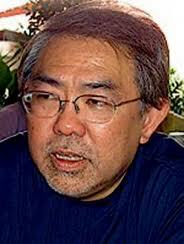 However, by December 1974, Chin would be expelled from University Singapore along with 5 other foreign students for what the university authorities called "western student militancy". 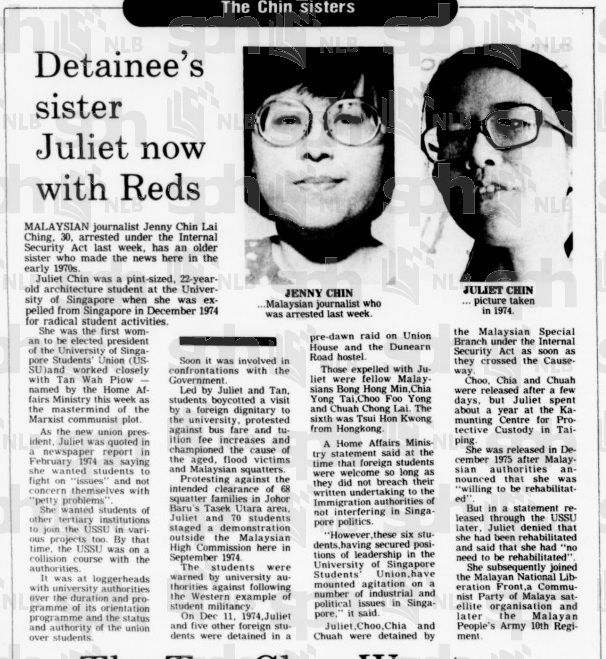 Her younger sister, Jenny Chin Lai Ching, a Malaysian journalist, was one of those arrested in Singapore in 1987 during Operation Spectrum aka Marxist arrests. The USSU led by Chin and TWP opposed the university authorities and the government of the day on various issues. They boycotted a visit by a foreign dignitary to the university, protested against bus fare and tuition fee increases. They protested against the intended clearance of 68 squatter families in Johor Bahru's Tasek Utara. Chin and 70 students even staged a demonstration outside the Malaysian High Commission in September 1974. This perhaps sparked off a raw nerve in the young independent Singapore government which was sensitive to those calling for a re-merger of Malaysia and Singapore while the communist threat was still active. After Chin was expelled, she was put in preventive detention under the Malaysian authorities for about a year before she joined the Malayan National Liberation Front (MNLF) and then finally the armed Communist Malayan People's Army 10th Regiment marking her transition from student activist to a full fledged communist insurgent. In June 1974, TWP also led an agitation against the arrests of 30 members of a Communist Party Malaya proxy organisation, the MNLF. He rallied students in the Singapore Polytechnic Students Union to hold a join inquiry with USSU into the arrests. 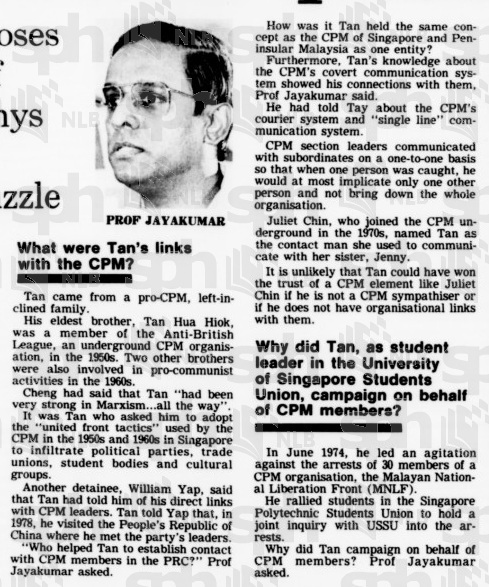 According to the Home Affairs Minister, TWP came from a left-inclined family where his eldest brother was involved in the Anti-British League, an underground CPM organisation while his two brothers were also involved in pro-communists activities in the 1960s. But family background by itself was not enough. According to the Minister, TWP's communists credentials were most evident in his direct contacts with known communists. One of the Marxist detainee, William Yap said that Tan had visited PRC in 1978 where he met party's leaders. Juliet Chin who joined the communist underground also named TWP as the contact she used to reach her sister, Jenny Chin indicating that TWP was a trusted person. TWP himself denies charges that he is a communist in his book "Let the People Judge" released shortly after the 1987 Marxists arrests. He said, "As to how we bring about the implementation of the political programmes in Singapore, I stated in no uncertain terms in my writings, letters to friends and public speeches in the United Kingdom, that I sought to bring about political change in Singapore solely through the ballot box...How could there ever be such a plot to establish a communist state when the so-called "mastermind", that is, my humble self, confessed in no uncertain terms that I oppose the very idea of turning Singapore into a communist state? Why does the Singapore goverment insist on calling me a communist when I am not one?" However, it should be noted that many patriotic nationalists were mixed in with the communists during the post-war period and into the 60s as the communists were the only form of viable opposition to colonial rule. Without the organisation might of the communists, parties such as the English-educated PAP would never have so successfully captured the imagination of the masses. In a way, the PAP made good use of the communist network; the communists must have felt cheated and used. Such is the game of politics. Looking back, it was indeed a lost generation where young and brilliant men and women convicted in their beliefs, followed their aspirations and tried to change the world in their own way. But as cruel as war and politics are, it was hard to accept defeat as defeat came with a heavy price and unaccounted sacrifices that wail like screeching whispers along the corridors of Singapore's history. Endnote: In December 1974, those who were expelled along with Juliet Chin were Malaysians, Bong Hong Min, Chia Yong Tai, Choo Foo Yong, Chuah Chong Lai and Hongkonger Tsui Hon Kwong. All the Malaysians were picked up by the Malaysian Special Branch except Bong. Those arrested were all released except Juliet, who served a year in Kamunting. Juliet, Chia and Choo will later join the Voice of the Malayan Revolution, a Communist Party of Malaya radio service that broadcasted from South China between 1978 and 1981. When the radio closed down, they were said to have resettled in Europe under amnesty with the help of TWP. why twp call himself humble self when he was quite arrogant in front of the judge. he very kwai lan also lah. haha. Wah Piow, Juliet and their close mates were known to be leftists during uni days, we had some inkling that they were connected to the reds but no one really knew how real their connections were. You don't talk about such things, it could really put you behind bars. But those days in USSU were crazy and fun, leading the careless life of a hippie...free love people! Damn bloody nostalgic stuff! If these guys were allowed to have their ways, what would Singapore be like today?